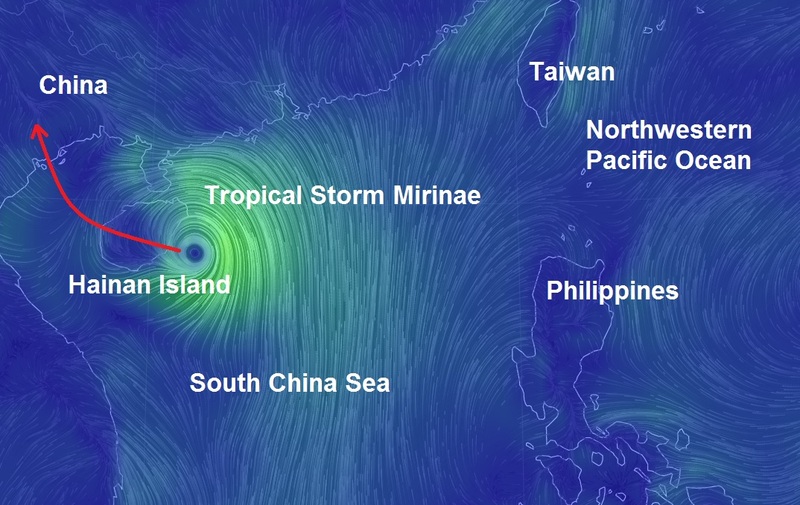 As of Tuesday morning, EDT, the center of Tropical Storm Mirinae is centered about 230 miles southeast of Haikou, China, drifting towards the west-northwest at 14 mph with highest sustained winds of 40 mph. This storm is forecast to remain a tropical storm before reaching eastern Hainan within about 12 hours. Beyond Hainan, a track across the Gulf of Tonkin to Guanxi, China, or nearby northern Vietnam is likely as of midweek. Land interaction should preclude a well-wrapped tropical cyclone, but localized flooding rainfall and damaging winds can accompany the cyclone along its path, reports Accu weather.